Time Running Out For A Two-State Solution? Is Peace Out Of Reach? Relentless Israeli air attacks against Gaza’s Hamas rulers continue. Learn about the people, economy and history. (CBS) Getting a peace deal in the Middle East is such a priority to President Obama that his first foreign calls on his first day in office were to Arab and Israeli leaders. And on day two, the president made former Senator George Mitchell his special envoy for Middle East peace. Mr. Obama wants to shore up the ceasefire in Gaza, but a lasting peace really depends on the West Bank where Palestinians had hoped to create their state. The problem is, even before Israel invaded Gaza, a growing number of Israelis and Palestinians had concluded that peace between them was no longer possible, that history had passed it by. For peace to have a chance, Israel would have to withdraw from the West Bank, which would then become the Palestinian state. It’s known as the “two-state” solution. But, while negotiations have been going on for 15 years, hundreds of thousands of Jewish settlers have moved in to occupy the West Bank. Palestinians say they can’t have a state with Israeli settlers all over it, which the settlers say is precisely the idea. Daniella Weiss moved from Israel to the West Bank 33 years ago. She has been the mayor of a large settlement. 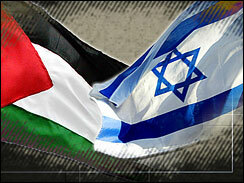 “I think that settlements prevent the establishment of a Palestinian state in the land of Israel. This is the goal. And this is the reality,” Weiss told 60 Minutes correspondent Bob Simon. Though settlers and Palestinians don’t agree on anything, most do agree now that a peace deal has been overtaken by events. “While my heart still wants to believe that the two-state solution is possible, my brain keeps telling me the opposite because of what I see in terms of the building of settlements. So, these settlers are destroying the potential peace for both people that would have been created if we had a two-state solution,” Dr. Mustafa Barghouti, once a former candidate for Palestinian president, told Simon. Palestinians had hoped to establish their state on the West Bank, an area the size of Delaware. But Israelis have split it up with scores of settlements, and hundreds of miles of new highways that only settlers can use. Palestinians have to drive – or ride – on the older roads. When they want to travel from one town to another, they have to submit to humiliating delays at checkpoints and roadblocks. There are more than 600 of them on the West Bank. Here’s how they block Barghouti: he was born in Jerusalem, grew up in Jerusalem and worked in a hospital there for 14 years. Four years ago he moved to a town just 10 miles away, but now, because he no longer lives in Jerusalem, he can’t get back in – ever. What he’s up against are scores of Israeli settlements dominating the lowlands like crusader fortresses. Many are little cities, and none of them existed 40 years ago. The Israelis always take the high ground, sometimes the hills, and sometimes the homes. And sometimes Arabs are occupied inside their own homes. One house for example is the highest house on the highest hill overlooking the town of Nablus. 60 Minutes learned that Israeli soldiers often corral the four families who live there and take over the house to monitor movement down below. Simon and the 60 Minutes team went to an apartment owned by a Mr. Nassif. That morning, Israeli soldiers had apparently entered the apartment, without notice, and remained there when Simon knocked on the door. Abdul Nassif, a bank manager said he had to get to his bank to open the safe, but one of the soldiers wouldn’t let him go. He told 60 Minutes whenever the soldiers come they wake everybody up, and herd them into a kitchen for hours while soldiers sleep in their beds. They can’t leave or use the phone, or let 60 Minutes in.